The Airports Commission published its Final Report in July 2015 stating its choice of Heathrow for expansion by building an additional runway on the north west side. In Part 1 we considered the effects of noise, the damage to health and child development and how deficient is the Commission’s report in these respects. We considered the evidence of the NORAH study and how this recent research has apparently been ignored in total by the Commission. Now we look at whether the Commission adequately looked at the effects of aviation upon climate change. The CCC [Committee on Climate Change] has recommended that in order to ensure that aviation makes a proportionate contribution to the achievement of the UK’s overall target for reducing climate change emissions, a planning assumption should be adopted that emissions from the sector should not exceed 2005 levels by 2050. 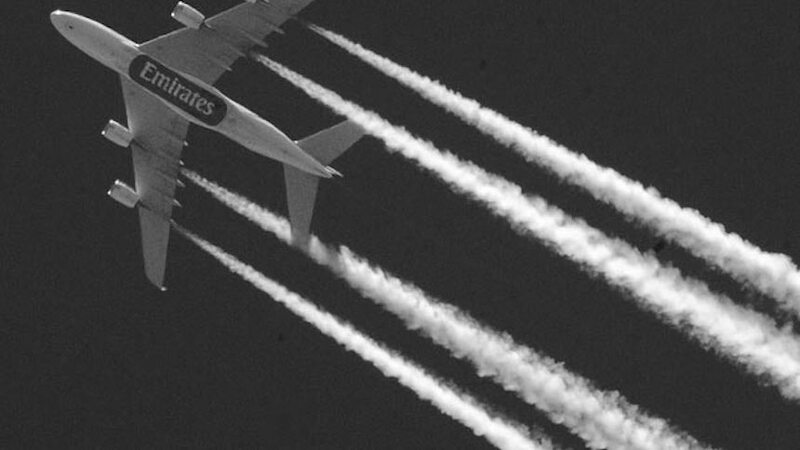 The CCC’s 2012 International Aviation and Shipping Review states that “The key driver of emissions reduction will be EU or global policies, and should not be unilateral UK approaches; therefore [this assumption] should be kept under review with respect to the evolving international framework, and changed as appropriate. We are, of course, now going to leave the EU, but this should not mean that the UK now adopts lower environmental standards, than those that have previously been adopted at a global level. The CCC’s planning assumption requires that gross CO2 emissions from UK aviation in 2050 should not exceed 37.5Mt, the level seen in 2005. On that basis, the economy-wide target of reducing emissions by 80% below 1990 levels could be achieved through other sectors reducing their emissions by around 85% on average. That is unquestionably no longer the case, even if it were in 2015, or indeed ever, the case. The Government’s Fourth and Fifth Carbon Budgets state that international aviation will have to be brought into the calculations to reduce greenhouse gases by 80% of the 1990 emissions and not just to the total aviation emissions of 2005. This will also be required to comply with the Paris Accord 2015 and all Nations’ obligations, intended to be ratified by their respective governments, to keep global warming to below 2º above pre-industrial levels. Aviation, as is the case for virtually all sectors, has thus far failed to develop a scientifically credible emission pathway toward a 2 ◦C future. If such a pathway is not forthcoming in the next few years, it will be evident that the sector either rejects the international community’s 2 ◦C commitment, or has judged itself too important to make its full contribution, relying instead on the untenable assumption that other sectors will compensate. The aviation industry cannot be isolated from the dialogue on climate change, and as a mature industry it is incumbent on it to be clear as to its position on 2ºc, carbon budgets, and the mitigation challenge. It is not just the academics researching climate change who are ringing the warning bells. The latest Committee on Climate Change Progress Report of 2016 to Parliament shows in its summary chart that the “plan to limit UK aviation emissions to around 2005 levels by 2050, implying around a 60% potential increase in demand, supported by strong international policies” is in their view relegated to the category of “New Policy Required”. The reason is that, according to the CCC Report, we as a nation still have a long way to go to get to the 80% reduction. The CCC Progress Report says that the prospect of further reductions is unlikely to come from the energy supply sector, which has embraced renewables to the maximum that it reasonably can and that to “meet emission reduction targets going forward, reductions will need to be broadly based, across all sectors of the economy” – completely contrary to what Davies said above. diseases outside the UK. For example, preceding year drought is a significant risk factor for mosquito- borne West Nile virus in the USA. The mechanism may be that drought reduces the population size of predators, allowing unchecked vector population growth when the rains bring suitable conditions (Wang et al., 2010). These conditions are often brought on by the El Niño Southern Oscillation (ENSO). One of the strongest ENSOs ever recorded occurred in 2015/16, and the large epidemic of mosquito-borne Zika in South America in the same time period may not be coincidental. The transmission of vector-borne disease is also known to be affected by temperature. Higher temperatures shorten the incubation period of the pathogen within the vector and thereby increase their transmission efficiency (Baylis and Morse, 2012). The spatial distribution and seasonal activity of pest and vector species are also affected by temperature and humidity. Changing climate conditions may facilitate the introduction of new insect and tick disease vectors and pests to the UK. However, some vector species, such as the Ixodes ricinus tick that transmits Lyme disease, is already distributed throughout the UK (Medlock et al., 2013). The Ixodes ricinus ticks are mostly encountered in the countryside, but are also present in urban parks: for example in South London (Nelson et al., 2015). Overall, current surveillance programmes for vector-borne diseases are largely passive, small scale and ad hoc. These factors will limit the capacity of the UK to detect invasive species and changes in distribution”. Crops are sensitive to weather and therefore a change in climate means that yields and overall national productivity are also very likely to change. Depending on the crop, and the rate and magnitude of climate change, there will be both risks and opportunities. The influence of climate at present is most evident during extreme years. The vulnerability of UK production at these times can lead to increased imports to meet demand. Future yield projections have considerable uncertainty due to the influence of multiple factors, the high degree of geographic variation in these factors, and sensitivity to the rate and magnitude of climate change (including CO2 levels). Major crops such as wheat and sugar beet could potentially increase in yield, but not by as much as implied by CCRA 2012, and only if there is appropriate adaptation to changing climatic conditions. Production of some crops, such as potatoes, may be adversely affected by reduced water availability in their current growing areas. Although future climate change is highly likely to involve a reduction in cold-related stresses and potential benefits for grassland production from a longer growing season, risks from heat stress, water availability and wetter winter conditions are expected to increase. Grassland productivity may be reduced if conditions become too hot and dry or the soils become compacted or waterlogged. The most significant risk from higher temperatures is buckling. In 2003, 137 rail buckles cost £2.5 million in delays and repairs. Buckling events are expected to be four to five times more frequent by the 2050s (Jenkins et al., 2012). By the 2080s, the annual cost of buckling and heat-related delays under a high climate change scenario could increase eightfold (Dobney et al., 2009). Temporary speed restrictions are imposed to manage the potential likelihood and consequences of track buckles on the rail network. They are projected to increase by a factor of four, from 0.5 days to two days per summer season (range: by a factor of 2.5 – 7, based on southwest England for the 2040s). The impacts of climate change on UK aviation are expected to be the least significant of all transport modes. The largest challenges are currently due to extreme weather (Heathrow Airport, 2011). Snow and ice continue to be a problem as evidenced by the heavy snow of December 2010 (Begg Report, 2011), although this risk is expected to be reduced with climate change (Brown et al., 2010)”. Davies has not foreseen any of this at all. The Commission have been totally focused on the economic benefits without any proper thought of the consequences of this profligacy. The mess and destruction that we are heaping upon the next generations can only be described as utterly irresponsible. The true irony is that nearly 40% of traffic through Heathrow is transfer passenger traffic giving no benefit to the Country other than landing fees to Heathrow and its shareholders.